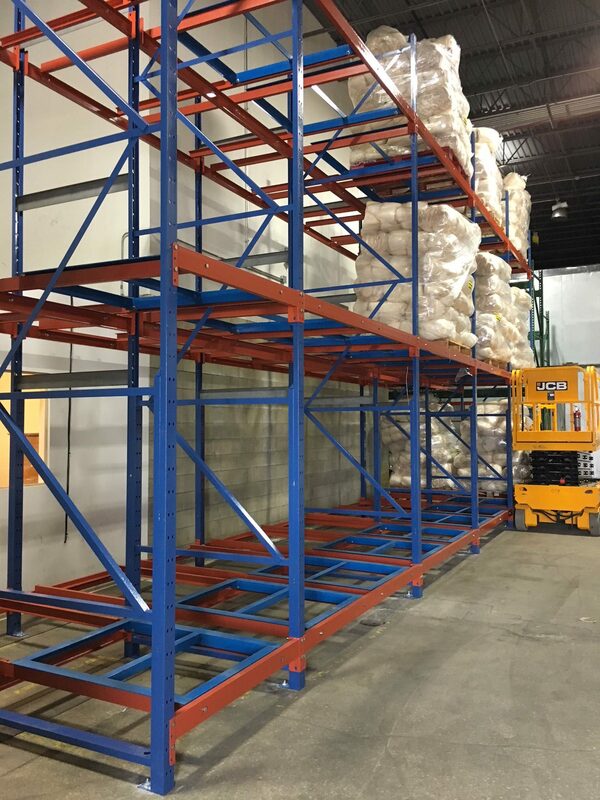 Pallet flow and push back rack are two of the most commonly used types of rack systems in a foodservice distribution center, and for good reason: both systems provide excellent space utilization and have unique attributes for storing and distributing food and beverage compared to other types of pallet rack. Although each system has similar benefits, these benefits are only effective if used for the right application. Factors to consider include product characteristics, picking processes and space availability. Read this article to find out which type is best for you! 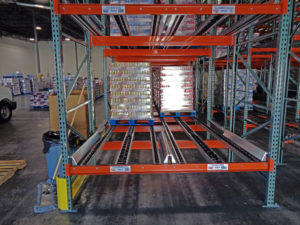 Push back rack is a last-in, first-out gravity storage system that uses carts that are pushed along inclined rails. 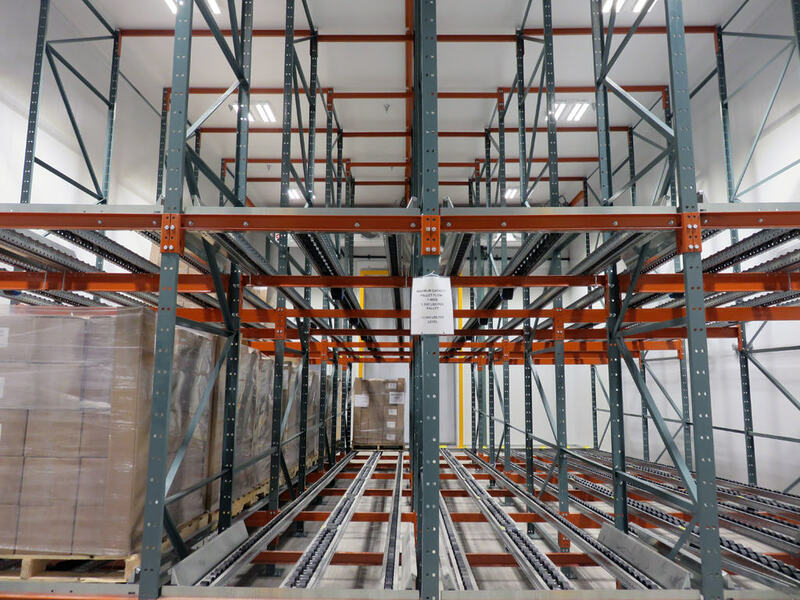 This rack system provides high-density as it only requires one aisle for picking and allows access to multiple groups of SKUs. Each pallet is loaded from the front of the system on to a cart. In order to load the next pallet, you must carefully push the first placed pallet position with the pallet you are attempting to store next. When the next pallet is loaded, it slowly pushes the previous pallet back to allow for the new pallet to align with the next available cart. When the front pallet is unloaded, the pallet behind glides to the front for picking. 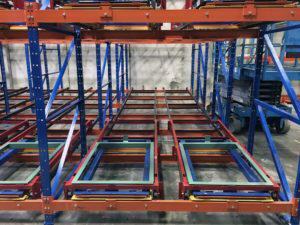 Pallet flow rack is gravity flow storage system designed for first-in, first-out applications. Pallet flow uses inclined rollers, or wheels, that allow pallets to travel from the loading position down towards the picking or unloading position. The inclined rails allow for pallets to automatically travel into a picking position when the front pallet is unloaded which provides high inventory rotation and high storage-density. When is it best to use push back rack? Push back rack is a last-in, first-out storage system. Therefore, if the inventory you are storing is date-sensitive, push back rack would not be beneficial. Push back is also limited to 6 pallets deep, so if you need to store 7 or more pallets deep, push back will not be ideal for you. 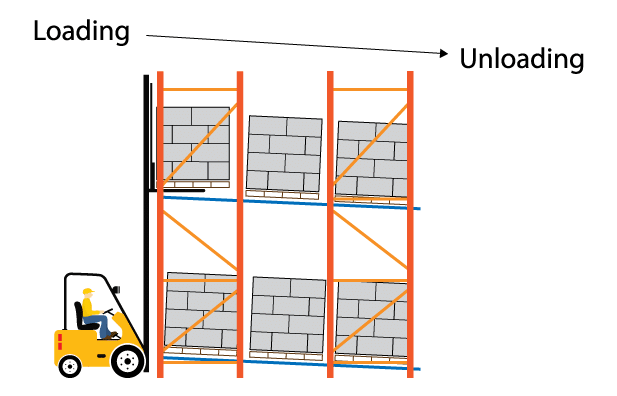 Push back eliminates the need for separate loading and unloading aisles, allowing for more density in your overall space (although, as mentioned in the next section, pallet flow has higher density within the rack system itself). Because of this, push back rack is often ideal for smaller areas, like cooler or freezers, where space is often limited. Pallets can be loaded and unloaded more quickly because of the single-aisle accessibility, which minimizes labor efforts. 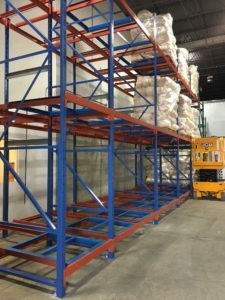 When is it best to use pallet flow rack? Unlike push back, pallet flow is a first-in, first-out gravity flow storage system. This makes it ideal for items that are date-sensitive because product rotation is more automatic. 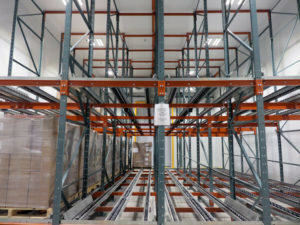 If your space allows for an extra aisle and you’d like higher density within each bay, pallet flow may be right for you. Pallet flow can store up to 12 pallets deep and offers higher density apples-to-apples per bay vs. push back. Braking systems or speed controllers are design elements that may be engineered into pallet flow systems to help pallets gently travel from one position to the other. This is beneficial for sensitive food containers, like glass or carbonated beverages, that need extra caution to ensure they don’t break or spoil when they move from each pallet position. Keep in mind that you’re not restricted to one or the other. There may be a location within your DC in which pallet flow is ideal, such as an area which you store perishable items, as well as a location in which push back rack is ideal, such as your cooler or freezer area. That’s why it’s important to evaluate each area individually in order to produce the optimal overall storage and flow process that a material handling system can provide. If you think your operation would benefit from incorporating push back rack, this case study showcases how REB was able to maximize a company’s cooler storage area and eliminate the need for storing pallets on the floor. study showcases how REB provided a solution to satisfy a beverage distributor’s high-volume, date-sensitive inventory while safeguarding that no inventory spoils. It is important that your storage system design is able to meet your inventory needs and accommodate your company’s growth. Fill out the ‘Submit Your Inquiry’ Form to get in touch with our industry experts, who can help answer questions regarding what system can benefit your inventory the best.